Halloween has always held a special place in my senses. The way the vast assortment of candy tickles my taste buds, the mystery behind selecting and crafting a unique costume, and the pure and distinct smell of a pillow case full of candyâ€¦MmmmMmm it surely is an appetizing holiday (with the exception of the gooey feel of carving a pumpkin- gross!). 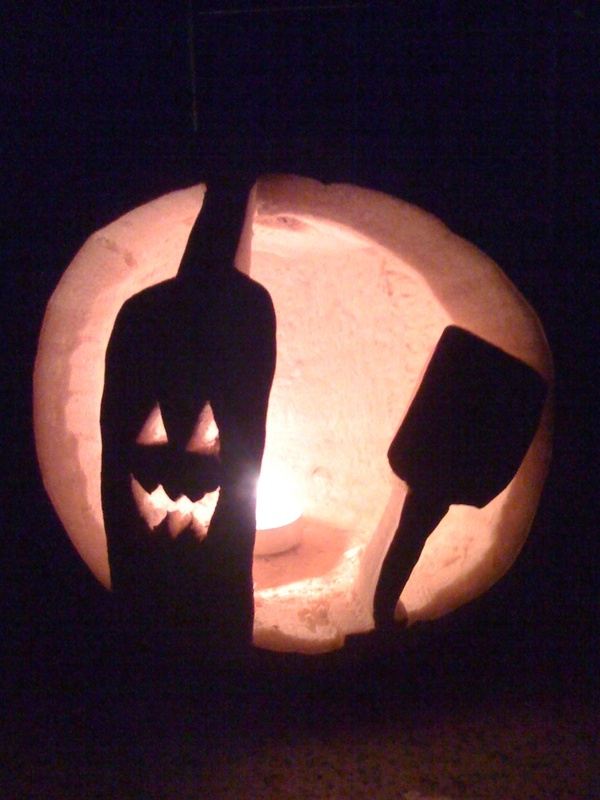 Wine bottle and glass pumpkin. Carving (especially gutting it)- mundantory activity!!!!! I want to be the house known for the crazy lady who answers the door. A few years ago, I stayed home on Halloween due to some physical ailment (I’m a hypochondriac so who knows the diagnosis that particular day?!) and handed out candy. The whole procedure of candy giving, as the giver, was incredibly boring. The costumes were NOT cute (despite my most kind and insincere compliments with an encouraging smile), the kids seemed ungrateful (despite the king size candy I delicately dropped in their bags), and not one child shouted “trick or treat” with passion. After noticing this decrepit pattern, my sister and I changed the pace immediately to save ourselves and Halloween with some tricks of our own. “Trick or Treatâ€¦” they said. “Trick,” as I solemnly pretended to pull my thumb apart from the middle. The kids stood perplexed and clearly didn’t know whether to laugh or throw an egg at my face. I caved and gave them candy that I enthusiastically made appear from the back of their ear! As to not hurt my feelings, each kid slowly dipped their hand into the canned-bowl and chose between corn, pickled beets or chopped olives. With the same confusion, they took the candy while we giggled. “Trick or Treatâ€¦” they saidâ€¦. We then proceeded to rummage through their pillow cases for a Charleston Chew or Milk Duds. Not one child seemed amused, nor did they actually let us take their candy, so I instead gave them two candies for the trouble. “TRICCCKKK!! !” We screamed before they could mutter it, opened the door and handed the candy to them with straight faces and no words. Knock knockâ€¦With a loaded candy bowl. “Knock knock,” I responded after slightly opening the door. “Everyone circle your left arm over your head until the joke is overâ€¦Knock knock,” I repeated. “Who’s there?” one child responded with grave hesitation while circling his arm. “Yaw whoooo?” as they continued circling their arms. I again gave them two candies because no one but me and my sister laughed. Yahoooo!!! Get it? No? Staying home to catch the looks on the kids’ faces when they see the bowl full of canned food is PRICELESS and I prefer that instead of a bar outting any time! I will be in D.C. this year for this special day and will inevitably miss out on the buffoonery of handing out candy. I hope dearly that someone will take my place as the crazy lady by implementing these tricks into the treat-giving experience and to make fools of themselves, the princesses, goblins and Harry Potter characters that beg for candy. On a side note, if a kid ever knocks on my door dressed as Oliver Twist and says “Please, ma’am, may I have some more?” I will dump the entire bowl of king sized Butterfingers into his pillow case without playing one trick. How creative! Kids these days aren’t that smart though, are they? No, they’re not…they just aren’t, and I blame the lack of quality television programing like You Can’t Do That On Television, Pete and Pete, and Doug.